Are you new to the wonderful world of knitting? Or maybe you want to start a knitting project that can be finished quickly? No matter your skill level, you’ve come to the right place. Easy knitting patterns don’t mean that you’re creating boring designs, and we want to prove it! These seven easy knit patterns are all yours and are anything but lackluster. What patterns might you like? How about some simple accessories! Start with an easy knit hat and mitts that you can customize, then try slippers to keep those toes warm. There’s even a pattern for the ever popular cowl. Maybe instead you’d like a bag pattern?? 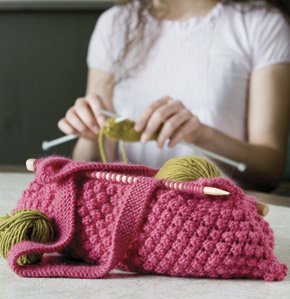 The knitting needle bag is a truly unique pattern, featuring permanently placed knitting needles and garter stitch handles. Ready to take the step into the world of garments? You’ll have a wrap and easy knit sweater pattern that even the most beginner can enjoy knitting. So go on … download your simple knitting patterns and get started today! What Easy Knitting Patterns are Inside? Easy combinations of knits and purls make this easy knit sweater pattern a standout—and its simple design make it suitable for beginners or those wanting a no-fuss project. The fresh, stylish result is so stunning, however, that no one will ever know if it was your first sweater or your fortieth. Pam Allen indulged her fondness for the berry stitch in this quick-and-easy knitting bag whose cigar shape was inspired by a bag she saw in a catalog. Rather than binding off, she placed the live stitches on wooden knitting needles, squished them together to form soft gathers, and applied superglue. This particular bag isn’t lined, but it would be an easy to add a cheery print lining to prevent needles from poking through. If you’re looking for an easy knit hat, this is the pattern for you! It’s a quick knit that you can dress up with a pom pom or leave plain. This workhorse hat will be worn and loved for years. Chunky yarn, a simple rib pattern, and a clever, easy construction make these easy slippers quick and simple to knit. Designed in five sizes, from toddler to adult, so a beginner or someone short on time can whip up matching slippers for the whole family. This easy sweater wrap is well-suited to beginners who do not want to be distracted by too many elements in a project. Here, all of the edges are left “bare”, which means they are allowed the freedom to roll slightly. The garter-stitch belt cinches the waist loosely or snugly, as desired, or can be abandoned altogether for a freer, more relaxed look. The Rainbow Cowl is an easy knitting pattern that you’ll turn to again and again. The yarn does most of the work here, giving the cowl a high-style look in a low-effort knit. 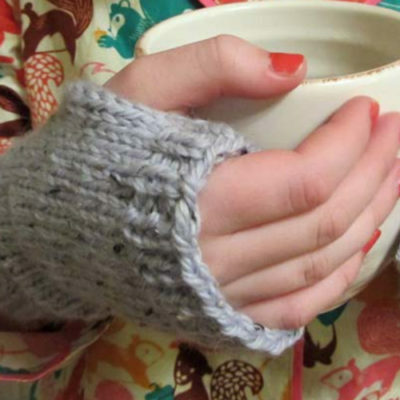 You’ll love making these easy mittens. If you can knit and purl, you can knit these mitts. Make a pair for everyone in their favorite colors, they’re sure to love these cozy knitted mitts. Sandi has carefully gone through each simple knitting pattern and added tips and tricks to guide you effortlessly through the projects. You’ll find lists of techniques, stitch guides, a simple chart primer, and a glossary of terms. 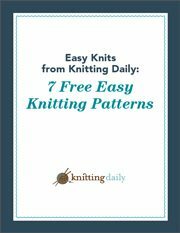 Easy patterns fabulous way to get started knitting and also perfect for those looking for a quick and easy fix. Each pattern included in this eBook is sure to be loved by you or that special someone. The real question is, with so many designs to choose from, which will you begin first? Grab your yarn and needles and download your free simple knitting patterns to get started. You’ll get a lot of bang for your buck (er, download?) 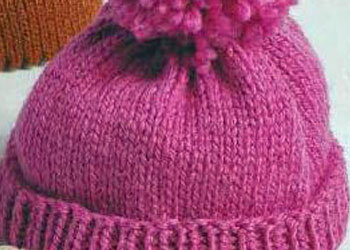 with these free easy knitting patterns, so click on the link and cast on!